Just over a month ago I was invited by the press office of the supermarket giant Sainsbury’s to attend the grand final of their Great British Beer Hunt, to be held on the last day of September at “the Brewery”, Chiswell Street, London, EC1. The objective was to select two bottled beers to be stocked in Sainsbury’s stores throughout the UK for a minimum of six months. Sainsbury’s had invited entries for all UK brewers in February, then had held four regional judging heats in May – at Edinburgh, Watford, Bristol and Uttoxeter. Beer experts and selected Sainsbury’s customers helped to choose four beers from each region as winners from the 106 entrants. These sixteen beers then appeared at Sainsbury’s stores during September and the two top-sellers from each region formed the eight beers to be judged at the grand final. 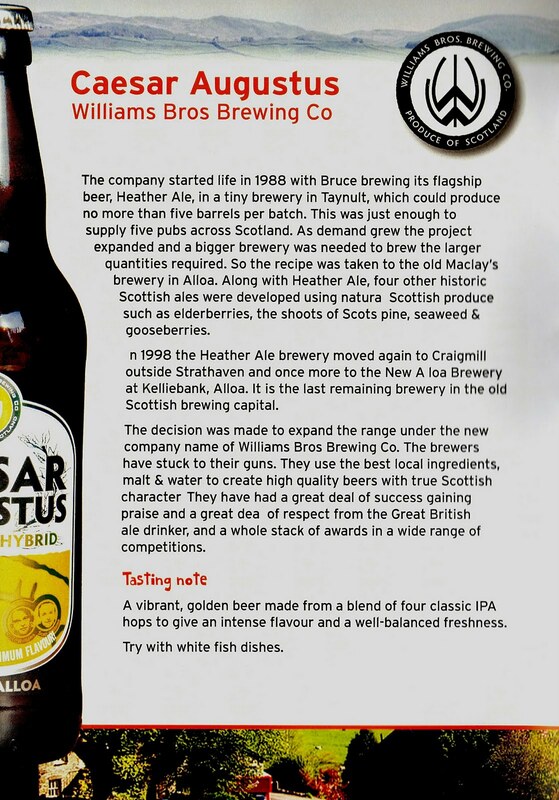 Rushed and flushed I was glad to have the immediate opportunity to quench my thirst with one of the day’s eight finalists, Williams Bros Brewing Co Caesar Augustus, described on the label as a Lager/IPA hybrid. This 4.1% crisp-tasting golden beer was an ideal refresher. 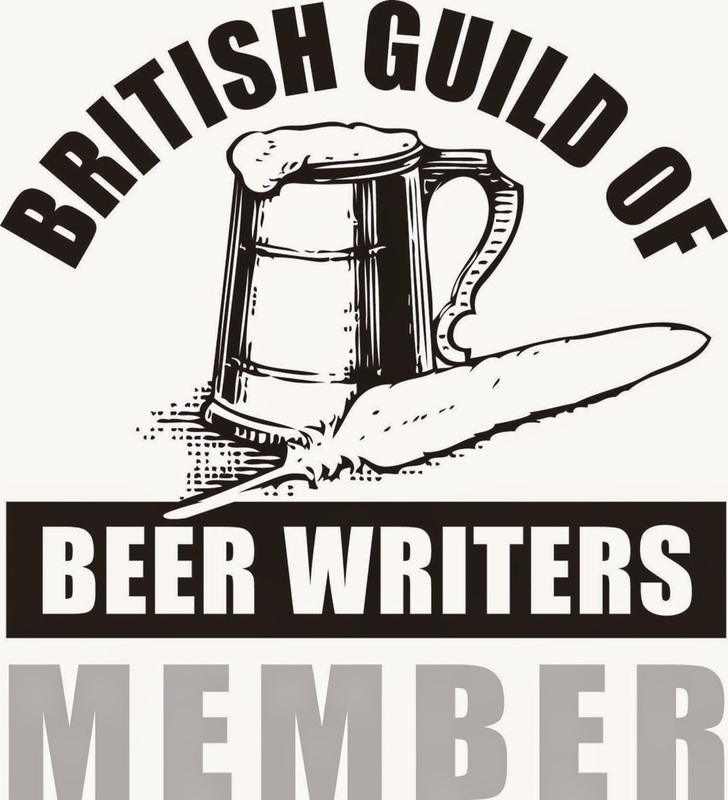 Over a leisurely buffet lunch beer-writers and Bloggers had time to chat to each other, to the organizers from Sainsbury’s, to those attending from the involved breweries while, of course, sampling the rest of the beers to be judged. Our host for the day, Olly Smith, well known a wine-buff, but a beer lover nonetheless and a witty and ebullient compere, invited brewers and their representatives on stage, in turn, while the serious business of tallying the judges scores carried on behind the scenes. “Ladies and gentlemen it’s a close-run thing” Olly exclaimed in his excitement, having been fed the latest news of the count. It was like a cross between an Election Night Special and the Eurovision Song Contest but with a more feverish atmosphere. 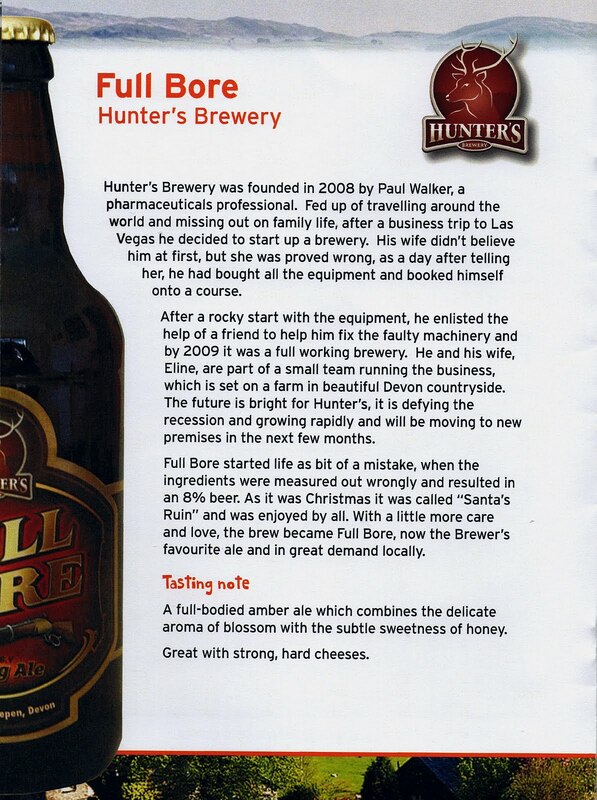 As the tension became palpable I fell into conversation with Paul Walker of Hunter’s Brewery. 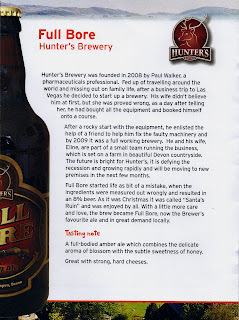 Paul, with his wife and business partner, Eline, began brewing as Hunter’s at a Devon farm in 2008 on a 5-barrel plant. Their 8.0% Full Bore entry at this final was first born out of a mistake over ingredients that resulted in a stronger beer than intended. Dubbed Santa’s Ruin, it was enjoyed by all as a Christmas Ale and laid the foundation for the recipe of today. Olly was right. It had been a close-run thing; but the two winners, finally announced, had been among my own top-three tips of the day. The runner-up was my first beer sampled, Caesar Augustus. 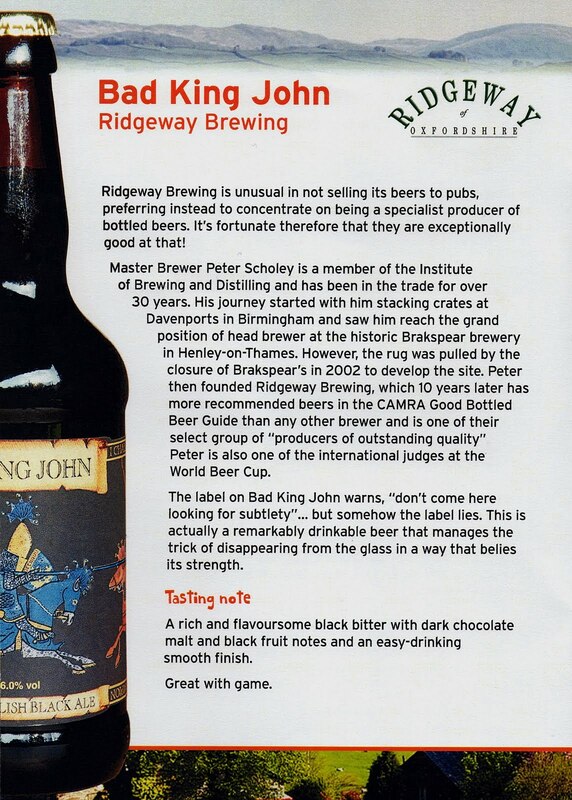 The winner was the beer I’d been drinking most of since that point, Bad King John, by Ridgeway Brewing, a powerful 6.0% black brew with dark chocolate and fruit notes. Look out for these two at Sainsbury’s stores throughout the UK. That concluded the official proceedings but let me say a word or two about my third favourite entry, the aforementioned Full Bore, by Hunter’s Brewery. Described in the tasting notes as “a full- bodied amber ale”, I found it more akin to a barley-wine and certainly one for keeping, at least until Christmas. The other five beers? Harviestoun Wild Hop IPA; Ridgeway Ivanhoe; Wye Valley Wye Not? ; Holts Two Hoots; and Sadler’s Worcester Sorcerer.